Every single time I hear the name or the phrase "Chow Fun", I immediately remember my favorite scene from the late 90's film "The Story of Us". It's one of the best romantic movies that I've ever watched in my life which I feel shows the realistic side of marriage. Of course, back when I watched the movie, I was still in high school so what do I really know about love and marriage, right? Fast forward to today, I think Paul and I should watch this again on one of our home movie nights as we'll finally be able to relate closely to Michelle Pfieffer and Bruce Willis' characters now that we've been a married couple for 6 years now. Now you know why I keep on remembering this scene whenever I hear the words "Chow Fun". In reality though, Chow Fun Restaurant & Bar is a relatively new foodie spot that specializes in noodles and is located at The Grandstand. 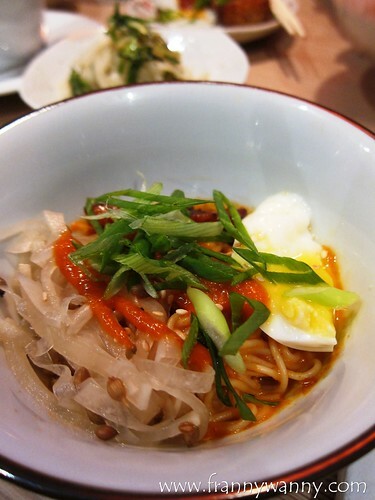 Why it chooses to specialize in noodles is simply because the owner, Chef Alicia Lin, loves loves loves noodles so it just makes perfect sense for her to share her passion with the public, right? Well, we're so happy with that! 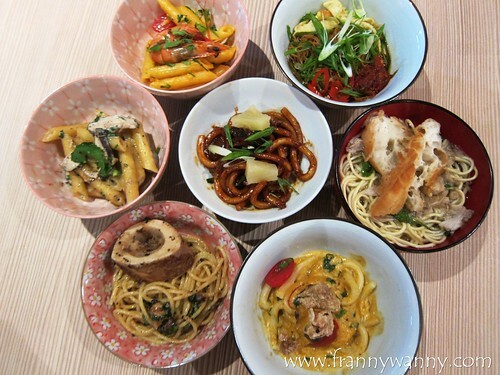 From rice noodles to vermicelli and even udon, penne and spaghetti, the restaurant offers a wide variety of noodle dishes for only S$2.90 for a solo-sized tasting bowl. 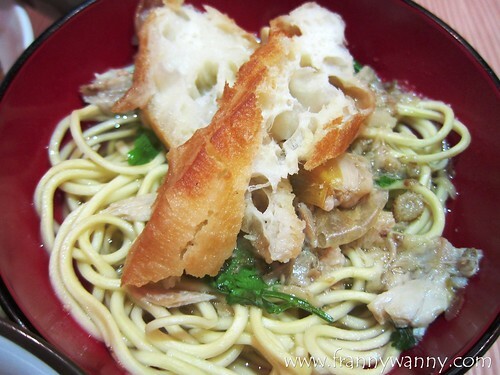 The main idea is for you to order as much noodle dishes that you want without having to hurt your wallet. However, for regular visitors who have found their favorite, then you can just opt to get the regular-sized bowls for only S$15.90. Since it was my first time there, I had the privilege to try 9... yes n-i-n-e different noodle variety allowing me to choose the ones that I loved the most. 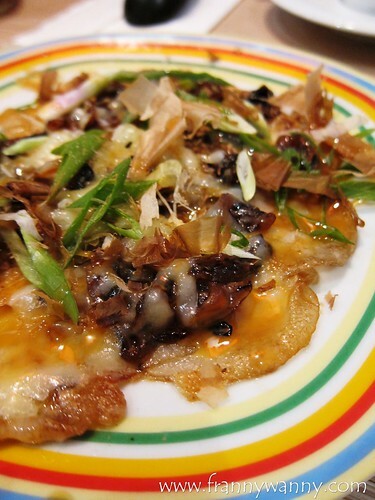 Before that though, we also tried a couple of starters such as the Potato, Bonito and Cheese Pancake (S$5.90) which is a cross between a nicely made rosti and the Japanese okonomiyaki. The size is quite small so I recommend that you order more than one if you're dining with a group. 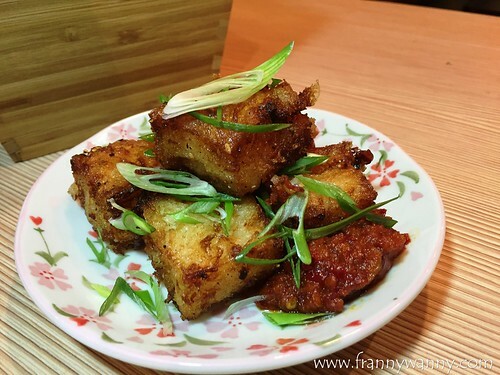 We also got to try Mom's White Radish Cake (S$5.90) which has a very homey, comforting taste. It's the kind that probably every Chinese kid (me included) has been enjoying at home. I love the inclusion of the spicy shrimp sambal which gave it an extra punch. 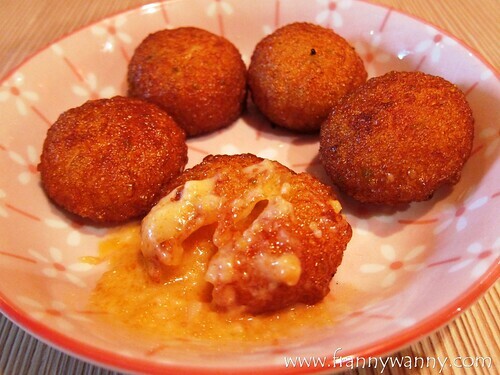 Another starter was the Fish Roe Fish Balls (S$6.80). 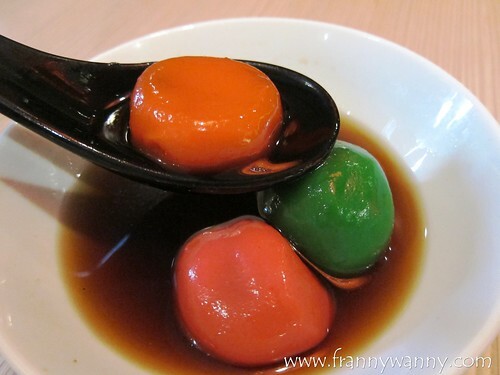 I'm crazy about fish balls and for one that's filled with gooey and creamy fish roe inside, this truly got me swooning. While it was a good starter, I would also order this as a side to my pasta dish which I think complements it very well. Moving on to the main stars of the meal, let me share with you first my top picks among the 9 different noodles dishes that I was able to try. First was the Wild Mushroom and Truffle Penne which is their version of creamy mushroom pasta with the strong infusion of truffle oil. 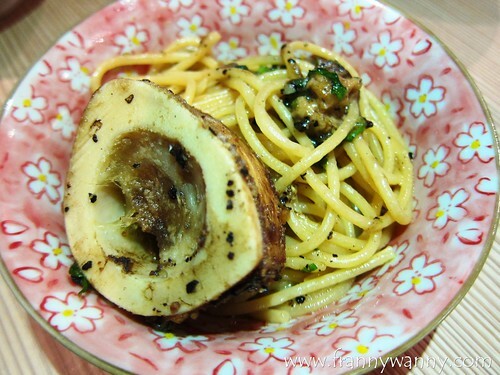 As you all know, I love anything with truffle oil and I love cream-based pasta too so this one immediately got my thumbs up after taking my two quick bites. I also enjoyed the Kung Fu Dashi Broth which reminds me of the traditional Singaporean bee hoon but cooked with savory dashi broth and served with strips of omelette and pickled green chili. It's a very simple that's bursting with just the right amount of flavor. 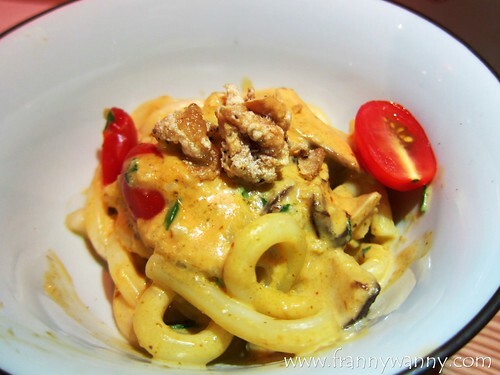 Another creamy noodle that I loved was the Tom Yum Cream which made use of Japanese udon. I'm really amazed at the wide variety and creativity of Chef Alicia in being able to come up with all these noodle and pasta dishes. The Tom Yum Cream noodle will allow you to taste a mix of spicy Thai tom yum sauce that's mixed with cherry tomatoes, mushrooms and prawns. The only thing that I wasn't too crazy about were those tiny bits of chicken skin on top which I quickly took out from my bowl. No biggie! 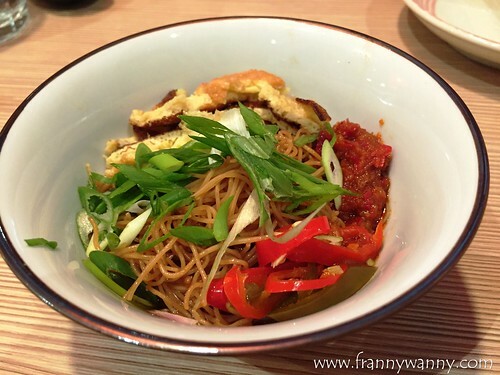 This is very similar to the Hokkien Cha Mi with a Thai and Japanese twist. 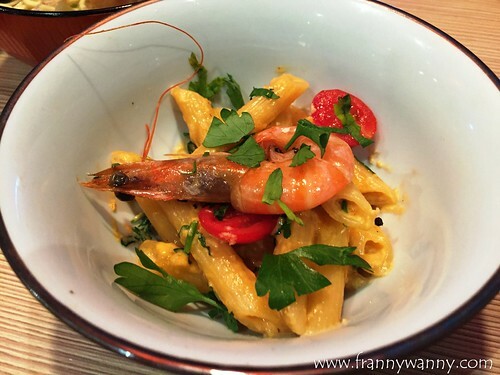 The last winning dish for me was the Pink Shrimp which also made use of penne noodles. 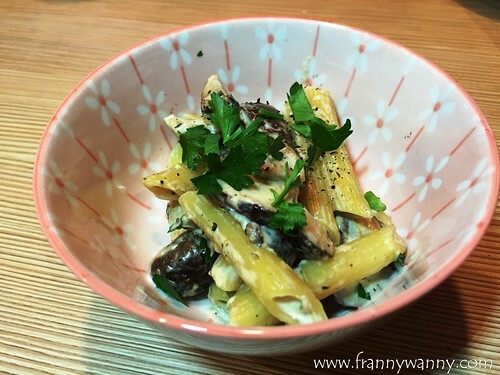 It's another creamy dish but it's not as heavy as the Wild Mushroom and Truffle Penne. This one was a mix of white wine, tomatoes and cream together with the locally-sourced fresh shrimps. As the saying goes: "Taste is subjective." Thus, these four were my top picks for that day, however here are the five other noodle dishes that I got to try which could be part of your top pick too! Of course, we can't just end our meal like that. We gotta have dessert! I really do appreciate it when restaurants put a lot of thought and effort on their dessert options. The most heartbreaking thing is when you enjoy your meal from starters to soups to salad to main and suddenly, everything crumbles down when you reach dessert. 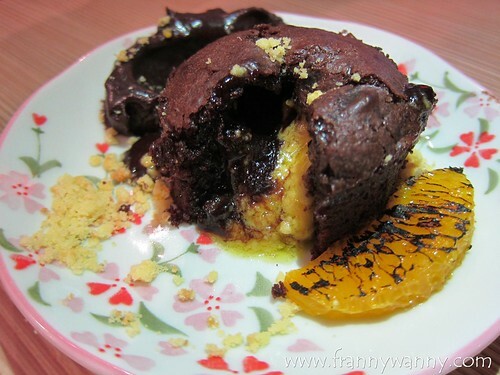 As for Chow Fun, I'm happy to announce that they got a number of yummy dessert items that you all have to try. I love the refreshing Lychee Granita with Crystal Jelly (S$4.90) which is just perfect to beat the unpredictable Singapore heat. While it was raining when I visited Chow Fun, I still happily enjoyed this dessert as it also served as a good palate cleanser after indulging on all 9 noodle dishes plus a couple of starters too. 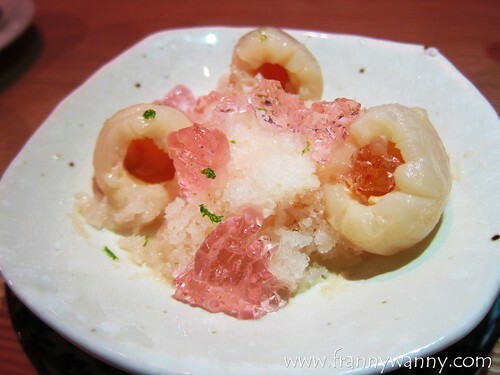 I love the light and fruity lychee flavored shaved ice which comes with rose-scented jelly. To be honest, I'm not a fan of anything that tastes or smells like rose (eg: bandung) but luckily, this was pretty mild and it complemented the lychee flavor very well. We also tried the Deep-Fried Caramelized Banana Fritters (S$6.90) which is their modern take on the traditional Goreng Pisang. 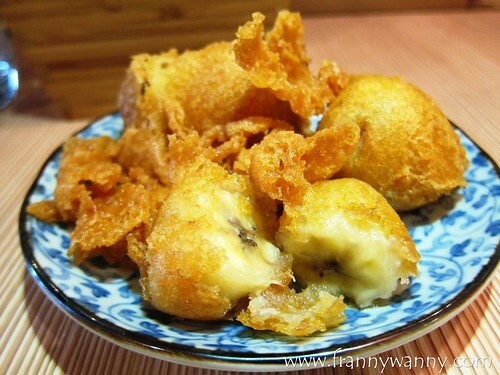 I remember having these banana fritters back when I was younger and the way it was prepared was to caramelized it and dunk it in a bowl of ice. I wasn't so sure why but it was so delicious! I also got to try the Black Sesame and Peanut Homemade Tang Yuan (S$6.90). Every Chinese New Year, Paul and I would have tang yuan which symbolizes unity as a family. Well, I realized that we don't really have to torture ourselves to just enjoying this once a year when we can actually have it anytime we want. There's really no harm to be more united, right? What I loved most about this dessert though were not the glutinous balls but rather the delicious ginger soup. This is also another great way to end your meal as ginger has a warming effect which aids in digestion. While going to The Grandstand may seem like you're heading to the middle of nowhere. Don't fret as they actually have a lot of shuttle buses that goes to the key points in the city such as Clementi MRT, Toa Payoh MRT, Botanic Gardens MRT and along Bukit Timah. Check out this link for the full shuttle schedule too. Nonetheless, I hope Chow Fun Bar & Restaurant would consider opening a second branch somewhere more central as I can imagine how this would be a great place to hang out while enjoying oodles of noodles day in and out. 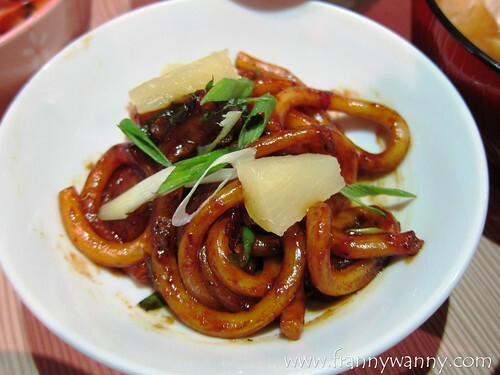 Check out Chow Fun Bar & Restaurant at The Grandstand, 200 Turf Club Road, #01-08, Singapore 287994. Call them at 6464-6900.